The dress was made from 2 pink bridesmaids dresses bought from Value Village. This outfit was inspired by Luly Yangs Butterfly dress, then escalated from there. I got many ideas from all over the internet. The dress was originally 2 ugly pink bridesmaid dresses bought at Value Village then cut up resewed and painted with screen printing paint. It has over 120 butterflies on it which I bought from floraltrims.com and the headpiece was inspired from one Martha Stewart did. The mask was made from 2 cheap masks painted and combined together with alot of old thrift store jewelry. I need to wear reader glasses so I bought a cheap pair took out the lenses and glued them between the masks. 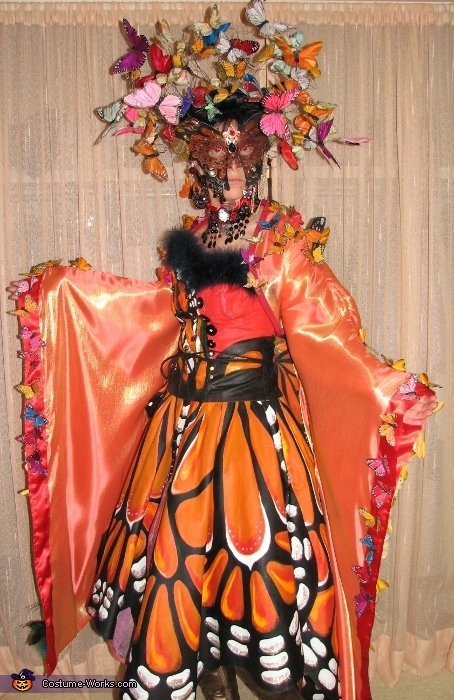 The funny part of this costme was when I was out playing for the evening in it the weather turned nasty and because the headpiece butterflies are made from feathers the wind kept trying to blow the wig straight off my head and fly away. Oh my god that is fantastic!!! Unbelievable! I've seen professionally made stage costumes that were nowhere near as well designed as this costume. Well done Katherine!